November 24, 2017 – If you do any reading on Reflexology, you’ll find many opposing opinions as to whether there are any true conclusive benefits to applying pressure to your feet improving your health. Practitioners of this type of therapy believe that the pressure applied to various areas of the foot might send signals that help to balance your body’s nervous system. That in turn could produce endorphins, that terrific natural “feel good” chemical your body can produce, and help reduce stress and pain. Whatever your belief on the topic, I would hazard a guess that there are a lot of us out there that think a good foot massage can really do the trick to make you feel a heckuva lot better! Especially if you’re in a profession that requires you to be on your feet for long periods of time. Hair stylists, food servers, and retail employees all spring to mind as we enter the holiday season where we’re all headed to the hair salon for a holiday ‘do, dinner out with friends, or doing all that Christmas shopping. If you are one of those that think a foot massage is the cat’s meow, try getting your next one while soaking in a hot tub. 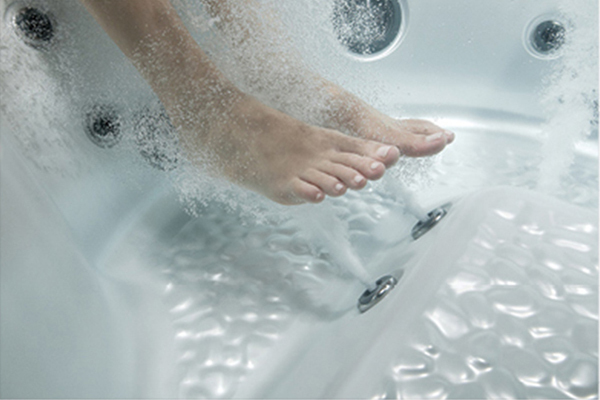 Naturally, a hot tub will feel tremendous after a long day on your feet. Once you’ve been in the hot tub for about ten minutes, you’ll increase the blood flow to your feet and the muscles and pressure points will be far easier to manipulate and massage. You’ll find you’ve elevated your foot massage experience to a totally different level—and you’ll love it! The coming weeks will be filled with lots of extra opportunities to become incredibly busy. Don’t forget to take some time to take care of yourself so you breeze through the season in style!